Book Condition: Ships same day or next business day! UPS shipping available (Priority Mail for AK/HI/APO/PO Boxes). Used sticker and some writing and/or highlighting. Used books may not include working access code or dust jacket. Whether it's needlepoint or woodworking, collecting stamps or dolls, everyone has a hobby, or is told they need one. But why do we fill our leisure time with the activities we do? And what do our hobbies say about our culture? Steven Gelber here traces the history and significance of hobbies from the mid-nineteenth century through the 1950s. Although hobbies are often touted as a break from work, Gelber demonstrates that they reflect and reproduce the values and activities of the workplace by bringing utilitarian rationality into the home, imitating the economic stratification of the marketplace, and reinforcing traditional gender roles. Drawing on a wide array of social and cultural theory, Hobbies fills a critical gap in American cultural history and provides a compelling new perspective on the meaning of leisure. Whether it's needlepoint or woodworking, collecting stamps or dolls, everyone has a hobby, or is told they need one. But why do we fill our leisure time with the activities we do? And what do our hobbies say about our culture? Seven Gelber here traces the history and significance of hobbies from the mid-nineteenth century through the 1950s. 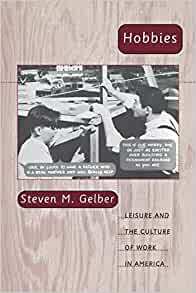 Although hobbies are often touted as a break from work, Gelber demonstrates that they reflect and reproduce the values and activities of the workplace by bringing utilitarian rationality into the home, imitating the economic stratification of the marketplace, and reinforcing traditional gender roles.